Some of Calgary’s more dense neighbourhoods where families are purchasing homes may see heavier traffic. Inner-city areas such as West Hillhurst, Sunalta, Bankview and Altadore are two such areas. As more families move into some of high-end duplex homes in these older neighbourhoods, the communities are springing to life with more kids out in costume. You could say these neighbourhoods are “rising from the dead”. But despite the proliferation of younger families choosing an inner-city lifestyle, the highest concentration of costumed goblins are in Calgary’s new communities in our sprawling suburbs. On the west side of the city, Signal Hill, Cougar Ridge and Aspen Woods. In the north west, Arbour Lake, Hamptons, Hidden Valley and the newer communities such as Nolan Hill, Sherwood and Evanston are hopping with little ghouls. In Calgary’s diverse northeast area, the huge neighbourhoods of Skyview Ranch and Saddleridge will be teaming with kids while down in the southeast, Cranston, Auburn Bay and Mahogany, full of young families out enjoying Hallowe’en, you’ll find best Calgary neighbourhoods for candy, Hallowe’en parties and homes decked out in eerie splendour. Those areas have among the highest ratios of dwellings filled with families that have children of primate “trick-or-treating age” according to Statistics Canada. Stats Canada defines those kids as being between the ages of five and 14 years. It’s these numbers that mathematics PhD Jens von Bergmann, a Vancouver software developer used to create his neighbourhood map. You can check out his colour-coded map here. Apart from neighbourhoods full of kids and parents with the energy to decorate, Calgary also has some naturally haunted areas that always draw a crowd around Hallowe’en time. One of the best neighbourhoods is Inglewood, Calgary’s original neighbourhood located east of Fort Calgary. 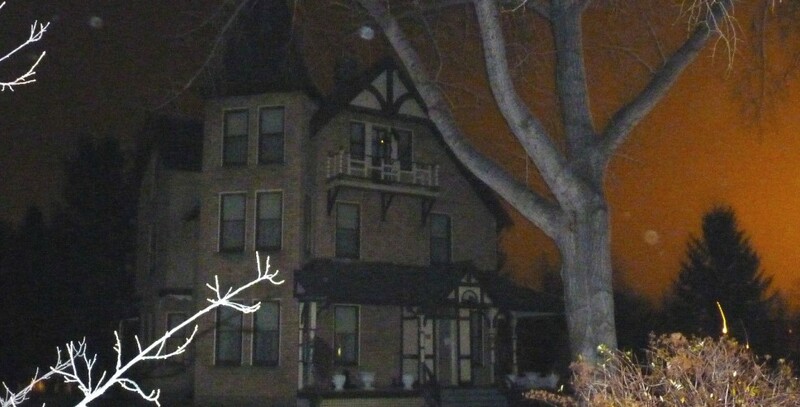 The Deane House, the areas by the former Zoo Bridge, the Garry Theatre, the Suitor House and the Hose and Hound are three spots in Inglewood where people have reported seeing shadowy figures or hearing a child’s eerie screams or mysterious. The Rouge Restaurant, which was once known as the Cross House, is said to be haunted by Helen Cross and her daughter Nellie who passed at the age of three. Pots and pans mysteriously fly around, doors will open all on their own and some have said they’ve seen a little girl and a fatherly figure sitting beside a fireplace. Downtown, the 100-year-old Knox United Church is said to be haunted. Apparitions of a woman knitting have been reported, while once an organist said that without a shadow of a doubt, his hand was slapped by a spirit who as unhappy with the way he was playing! In Calgary’s Heritage Park, which always hosts Hallowe’en events every October, the Prince House is said to be haunted with the figure of a woman – some say the image of Emma Prince - is often seen looking out a bedroom window on the top floor. Whether Hallowe’en is about candy or the thrill of a good scare, we hope you and your family stay safe this Hallowe’en. For the little ones, it’s always a good idea to wear reflective clothing, choose makeup rather than a mask which may obscure your vision and always check candy closely before consuming.